The Royal Wolf 40-foot container was converted into three separate pods as an initiative of Channel Seven to be used at events. The pods were transformed into a news studio, home & away décor and footy zone. 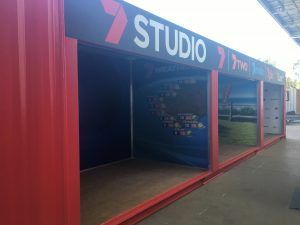 Challenge Channel 7 was searching for a solution that would allow them the ability of a showroom style unit that would incorporate both an aesthetic appeal to be used at events and durability to withstand any sort of condition. Solution Royal Wolf could offer container solutions that would allow the 40-foot container to be converted into three separate sections, with a wall dividing being implemented to segment the container into different sections. The versatility offered allows Royal Wolf’s containers to incorporate multiple different styles throughout the one container. Channel 7 were extremely satisfied with the ability to have 3 different show case areas that would allow them to host a variety of different showcasing’s within the one container. This enabled them to save money rather than having to seek out three different spaces for each one of the events on at the same time. Whilst providing them with the confidence of knowing the containers were able to endure any weather condition. Results Ultimately Channel 7 made the decision to work with Royal Wolf, as they knew Royal Wolf’s units could be styled and structured specifically in order to meet the requirements of Channel 7. The containers provided an aesthetic appeal whilst also being able to facilitate the durability that needed to be compatible for upcoming events. The three sections was transformed into a news studio, home & away section and a footy zone.